And so we spent five days in New Orleans, and it was pretty much as fun and relaxing as I had expected. Different places have different vibes. You can’t explain why, they just do. New Orleans and Los Angeles feel similar to me—like “anything goes, no judging.” Within limits, of course. There’s plenty of crime in New Orleans, and my friend who lives there has a bar near his house that’s a noisy nuisance. Did it feel relaxed because I was on vacation? No, that’s not it. I’ve vacationed in Berlin and Dubai, in Edinburgh, Scotland and Scottsdale, Arizona. I had some relaxed moments in those places, but they didn’t feel inherently relaxed. Was it because the car had been towed and was now in a shop? Maybe. The most memorable part of that was that the tow driver’s name was Earl, and Lynn and Christine thought that was hilarious. I guess if you think about it, coming from England, no one there would name their kid Earl—you either are an Earl or you’re not—but you wouldn’t be named Earl. It would be like if I had named Vince Vice President. 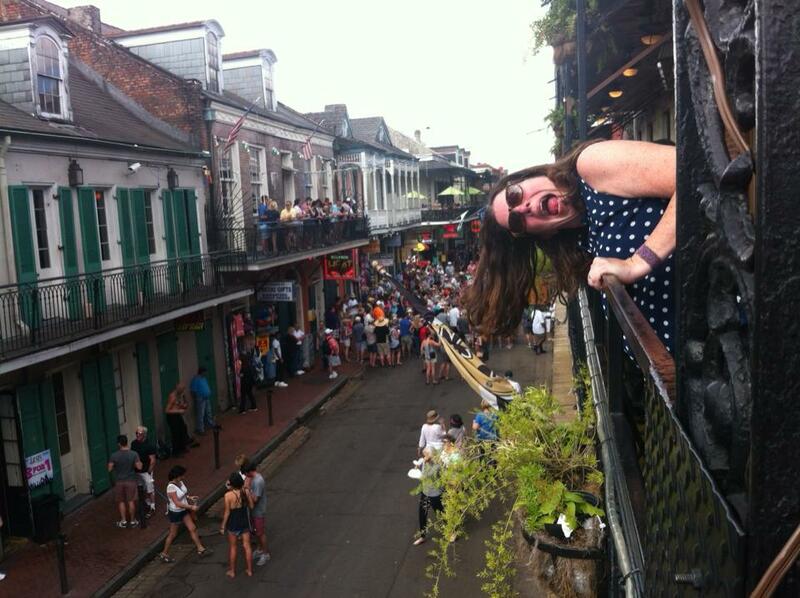 I had chosen the dates for New Orleans to coincide with French Quarter Festival. FQF is smaller than Mardi Gras and more musically encompassing than Jazz Festival. There were concerts featuring blues, rock, soul, and all sorts of jazz, all performed by Louisiana musicians. 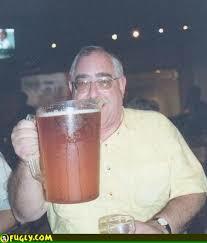 When we ordered beers, the server asked if we wanted large, medium, or small. That was an odd question; I’d never been asked that before. I figured a medium would be the safe choice. Now, I don’t allow my photo be taken in potentially-compromising situations. 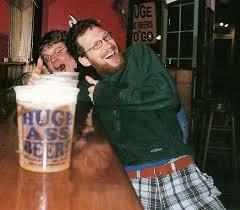 But there are plenty of people who do, so here is a photo I found on the Internet of the “medium” beer, along with the “large,” which I think you’ll agree is an understatement. We had all afternoon to sip our beers semi-responsibly, and we were lucky enough to be perched above a Dixieland jazz band which had attracted some energetic dancers of the Charleston. Here’s what the Charleston looks like. It’s athletic, exuberant, and just makes you feel happy. We started each day slowly, which is how it should be when you’re on vacation. I was always the first up; I can’t help myself. Still, the freshly-made breakfast would already be waiting for me in dining room. It was different every day, and a labor of love. There would be a frittata, muffins or some sort of fruit bread, veggie or meat sausage, homemade marmalade, and of course, coffee. You could make toast or bagels, or instant grits or oatmeal. The fridge was stocked with milk and orange juice and yogurt. I sat on the front porch and savored the morning quiet with my breakfast and a couple cups of coffee. There were the usual morning sights, like the trash men collecting the trash, parents walking their kids to school, cats skulking by the fence, and people commuting to work on bikes. Back inside, my crew and the other guests slowly filtered out of their rooms. There were two women there from Vancouver, one of whom got up early to run despite how late they stayed out every night. She and I stretched together on the living room carpet a couple times and chatted. There are six guest rooms at the Ould Sweet Olive, so counting our suite which slept four, its capacity was 14. The rest of the guests were couples from England, Scotland, the Netherlands, and Germany. Molly, Lynn, Christine, and I would sit in the front room for hours, chatting and drinking coffee, before we got our day underway. We talked about places we’d been, places we wanted to go, kids, pets, and—in hushed tones, politics—because our hostess had numerous photos of herself with Donald Trump on the walls. This entry was posted in Adventure, Budget travel, daily life, Joie de vivre, Travel and tagged New Orleans, Road Trips, travel on May 14, 2016 by Breaking Free.